Before you can attach any videos to the text messages you must first create the videos and upload them to your media library. If you have already uploaded media, you are now ready to create your video text campaigns. You may also follow these same instructions on your tablet or mobile. Click on "Tools" then "Campaigns"
You will see a thumbnail of selected video below holiday text message. You may now go to next holiday and repeat. Click "Save All Changes" when you have attached media to all holidays. Not Using CallAction to Send Video Text Messages? Are you are looking for intelligent automation to help you stay top of mind using the power of MMS video text messages instead of BombBomb video emails? 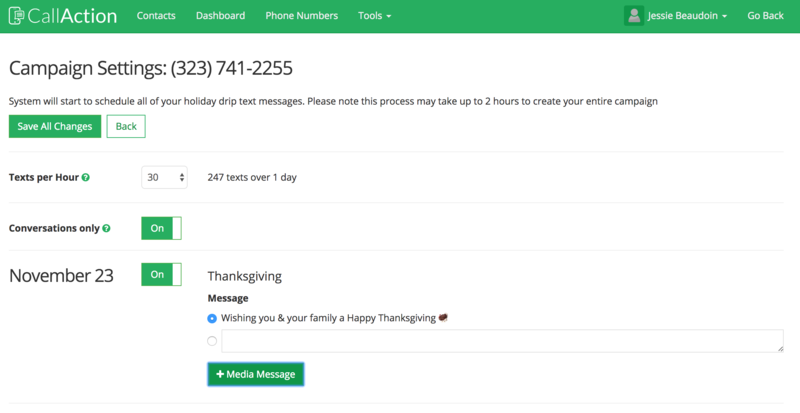 You can take 10 minutes to setup a CallAction account to start call capture / tracking leads and automatically start sending video text message.